I have had help with household chores ever since giving birth to my first child more than 14 years ago, from part time cleaners. But it has been close to 4 years since I engaged one, to manage some of the chores in my home. Okay, I admit it - my last engagement was a foreign part time cleaner. She came to clean my home every fortnightly, mostly to take care of my load of ironing. It was through hearsay that the cleaner had a work permit in Singapore, though I never truly probe directly from her, what kind of work pass she was holding to be cleaning homes around our island. I guess back then, I was just heartened when she told me she cleaned houses here so that she could put her child to school in Singapore. It was an honest living and I could relate to her as a mother, wanting the best for her child. Though I now know better that this could have implicated both parties if ever it was discovered to be illegal. I can also put myself in the shoes of others who are out to work and didn't have live in helpers. Many rely heavily on such part time cleaners too. It would be most unfortunate if the cleaners they have hired are unreliable and do not turn up for their assignment or decide to stop work without prior notice, leaving them in a momentous lurch that can be very trying until another help is found. "Who can I trust with the chores when I am at work?" "How can I spend quality time with the family on weekends if I don't get the chores done?" "How can I relax with so much housework to catch up on?" As for me, I was particularly bogged down with the pile of my husband's office shirts in my laundry basket that I cannot seem to finish ironing. It is the most time consuming job for me when I could have been more fruitful investing that amount of time in my jewelry work. So I was hoping that someone could relieve me of this chore. When Helpling came along to render their services, I was eager to try it out. Having another go at engaging help from a local part time cleaner this time, is something not very far in my mind since I have been busy with jewelry orders. I prefer this arrangement too as compared to having a live-in helper, so that we can all enjoy our privacy. The post weekend mess in my living room before cleaning versus the tidied version on the right. I love squeaky clean floors! Helpling is an online platform service connecting us with insured and trusted local cleaners from their pool of independent cleaners. Helpling hails from Germany and launched their services in Singapore earlier this year, their very first Asia's platform. 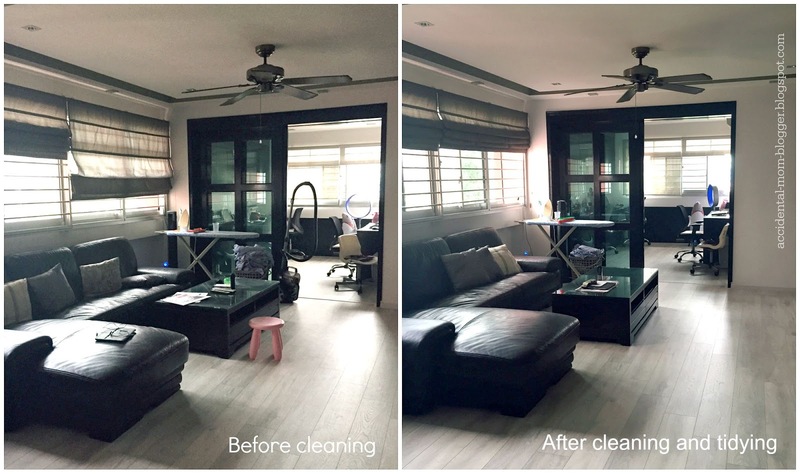 The fees start from S$18 an hour for a weekly or bi-weekly basic cleaning service, which includes dusting/wiping visible spaces, vacuuming and mopping of floor, washing the bathrooms, clearing the trash. The number of work hours depend highly on the size of your apartment. Additional services like ironing or cleaning windows are chargeable add ons. For a detailed price list with no hidden costs, please refer to this LINK. What I appreciate about this service is that there is no binding contract to adhere to. As long as you need someone to help with cleaning, they will have someone (whom you can entirely trust) hired at your preferred day and time. They also accept one-off cleaning services and best of all, if you are comfortable with a cleaner you have met, you can request for the same cleaner for recurring service! Emma was assigned to clean my home the other day. The first thing that I was appreciative of was her punctuality and unfazed attitude toward our pet dog, which was cordoned off in our service balcony while she cleaned, since I respect that she is a Muslim and may not be comfortable with a dog around. That's professionalism! After a short chat with her (so that we can be a little bit acquainted), I left her to decide what she would like to work on first. By the way, she was engaged to take on a 3 hour cleaning in my 5 room flat plus a 1 hour ironing add on service. I like that she is a fast and agile worker (and clearly enjoying her work with the music that I put on the background). She also moves around like stealth while I worked on my jewelry orders at the dining table, leaving me with the private space that I needed. She started off ironing the clothes for slightly more than hour before stopping to work on cleaning the living room, 3 bedrooms, vacuuming, mopping the floor and washing the bathrooms. She was done in 2.5 hours. With the remaining half an hour more before her scheduled time ended, she took the initiative to continue ironing the clothes again. In a total of 1.5 hours, she managed to iron 10 cotton shirts whereas I would usually take 18-20 minutes to iron one! *faint* So yes, I reiterate, this part is my greatest help of all! 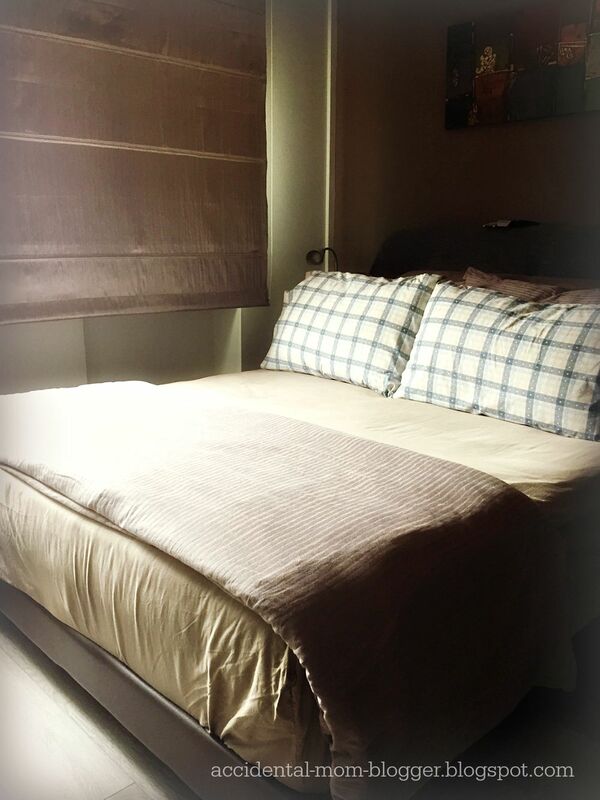 The cleaning package does not include changing of bed sheets but I appreciate that she bothered to make my bed so nicely, as with the kids' beds too! Before she left my home, she asked me to check to see if everything was in place and that if I am satisfied with her cleaning. I have no doubt with her honesty and ability, even though this was the first time I met her. I especially appreciate the flexibility that she has exercised on this cleaning assignment. She certainly takes pride in her job. 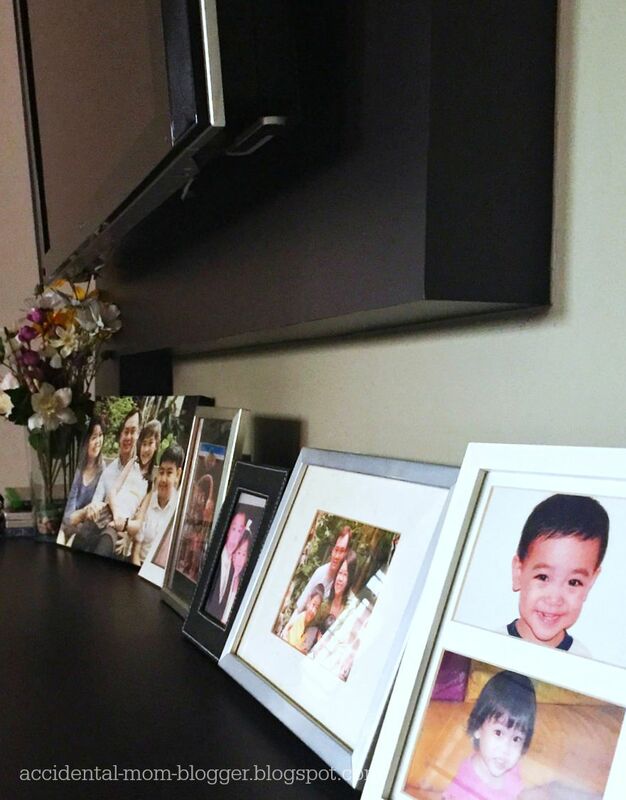 My favorite TV console area with precious family moments, all dust and clutter free! It sounds like a fantastic job done! How do I book a service? Try Helpling today and receive S$20 voucher!